Whether you are running competitively over any distance or just running in the gym to increase your cardiovascular fitness, there is little doubt that running is a highly beneficial activity to keep you both active and healthy. Running over the length of a career though is certainly not without its risks. These present mainly in the form of knee injury. Regardless of your surface, be it asphalt or treadmill, you are inevitably going to have a run in with injury at some point in time, the knees being by far the most commonly affected area. Since they are so susceptible to injury overall sustained period of running, there are many instances in which you could benefit from wearing a knee strap, both as a supportive measure preventing injury or when you are on the road to making a recovery. Being the largest joint in the body makes the knee a big target when it comes to injury. This is especially true when running, with the consistent downward force being exerted on the joint. Bones, cartilage, ligaments and tendons all play key roles in the successful joint function of the knee. Structurally, the knee joint represents the meeting place of three bones, the thighbone (femur), shinbone (tibia) and the kneecap (patella). Working in harmony with the other parts of the knee, they are vital to even the most mundane of tasks in our daily life. Articular cartilage helps to provide a smooth lubrication for the bones to slide smoothly against one another. This interaction of bones is vital to the functioning of the joint in its tasks. Every movement of the leg requires some teamwork among the interlinked parts of the joint. The ligaments of the knee joint, specifically collateral and cruciate ligaments, are what connect the bones of the knee joint to other bones. They also help to keep the joint stable and connected, much akin to the function of ropes, tying two parts together. The main focus of the collateral ligaments, MCL & LCL are in controlling lateral movement of the knee joint. The cruciate ligaments, ACL & PCL perform the duty of controlling back and forth movement of the joint. ACL injury can be among the most serious and difficult to recover from in any sport, especially for a runner. Dalvin Cook, Minnesota Vikings running back is just the latest to fall victim. Tendons are what link the muscles to the bones of your knee and are another area commonly afflicted by injury. 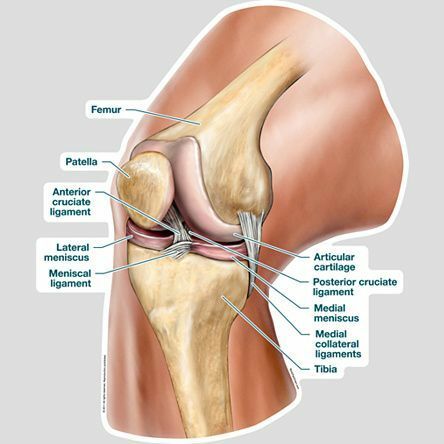 The quadriceps tendon and patellar tendon are the two which function prominently within the knee joint. The importance of stretching thoroughly before undertaking any physical activity likely to strain your body cannot be overstated. It is scientifically proven that those who do not undertake regular stretching before exercise, increase their risk of injury. 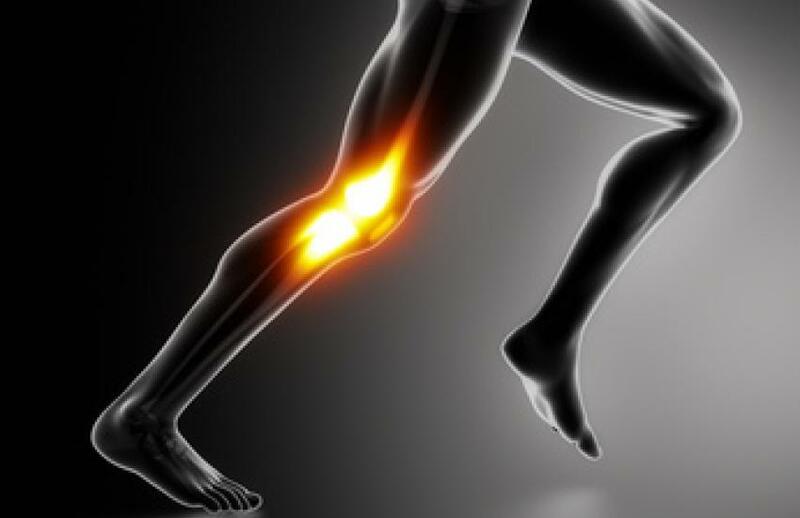 Running and knee injuries are no different. A lack of stretching for whatever reason, means that your muscles will be both cold and stiff. This is a recipe for disaster when undertaking a run. Although you may not directly notice, you will soon experience delayed onset muscle soreness. The pain of this can be increased greatly if you have failed to stretch enough or in the worst case scenario, you can suffer some serious injury. This is a common stumbling block, especially for new or time pressured runners who have a tendency to overlook stretching as an unnecessary use of time, often to their cost further down the line. A huge number of running injuries are caused simply through wear and tear. This could be the result of many long years of training taking its toll on the knee joint. It shouldn’t be forgotten that the knee bears the brunt of the workload in running more so than in most other activities. Another large contributing factor is simply putting too great an expectation on your body. What many call pushing yourself to the limit, could be a step to far for others. This overzealous training or over confidence in our capabilities often results in a painful ending. For this reason it is key to both know and respect your body and its limitations. This is something which is often only garnered through experience and in many cases, the damage done is already too much to fully repair. It is too little, too late in many instances. One of the most important choices you will make when running is which footwear to use. A shocking number of people do irreparable damage to their knees by wearing the incorrect footwear. Your footwear choice should be something which is appropriately sized and with the correct support to both keep the knee as stable as possible and also minimize the impact of the foot hitting the surface. Footwear which can best absorb the impact and vibration, acting as a type of shock absorber, should be prioritized. Many may overlook this choice due to a lack of choice, improved performance or a cost perspective. However, you can’t put a price on the longevity of your joints. Runners’ knee, otherwise known as patellofemoral pain syndrome (PFPS) is a gradual aggravation of the cartilage below the kneecap. This is characterized by the onset of pain below the kneecap which can be accentuated when squatting, walking or climbing stairs. Mild swelling may also be visible in the area. Being one of the most common complaints among runners’ this accounts for a high percentage of running injuries each year and has been the subject of countless studies over the years. If not correctly treated, it can become a persistently recurring injury. In terms of treatment, the most effective solution is to rest the area for as long as possible. This should help to combat symptoms. Running on less difficult surfaces can also be helpful. With this injury, you need to undertake an assessment of your running environment to consider how to best reduce the problem. Research shows that a change in stride length can be of benefit in preventing injury. This helps to reduce the load on your knee joints by shortening stride. Patellar Tendonitis is another overuse injury. It is an extremely common knee injury in basketball as well as among runners and is the result of repeated strain placed on the patellar tendon. Runners in their advancing years can be particularly afflicted with this injury as years of persistent pressure from downward force and unforgiving surfaces take their toll. Initially presenting with inflammation and pain in the knee area, rest and rehabilitative strength exercises are the remedy of the day when it comes to keeping patellar tendonitis at bay. As in so many cases, improving footwear to increase cushioning and avoiding uneven surfaces can be of welcome benefit. Meniscal tears are becoming increasingly common among runners. This is not always an injury associated with running, however, this is a wear and tear injury and as the average age of runners continue to increase, the risk of a resultant tear or aggravation of an old injury is also elevated. The meniscus acts as a form of shock absorber within the knee joint. The strength of the meniscus gradually reduces with age, leading to increased risk of torn or slipped cartilage. Factoring in the amount of pressure placed on the knee joints whilst running, it is plausible that the extra load bearing leads to a faster degeneration of the meniscus. Non-surgical treatment is often sufficient for treating a meniscus injury, this will entail adequate rest and the wearing of a protective brace or strap is always recommended. In the case of chronic or traumatic tearing, a meniscectomy may be recommended. These are generally very successful. The IT Band runs from the hip to just below the knee and is a thick band of tissue which, due to friction with the femur is one of the leading causes of lateral knee pain among runners. This usually presents as exterior knee paint located just above the joint. Swelling may also be present. This is another overuse injury which has a tendency to worsen over time. Strengthening the quad muscles with the correct stretching exercises and running on flat, even surfaces can help lower the risk of injury. Use of a foam role to help further stretch out the band and increase flexibility may also be helpful. Especially in the knee and during exercise, a knee strap will help to reduce niggling pains in several ways. First by reducing the pressure placed on the knee during physical activity, it can release much of the pressure causing pain in the joint. Recent research has shown that on this point, knee braces greatly help to reduce pain, especially so in the cases of knee osteoarthritis suffers. This is becoming a more prevalent issue among runner as the average age of those taking up the exercise continues to increase. By relieving pressure on the knee joint and in the case of some advanced straps, helping to perform some of the tasks of the joint itself, knee straps provide the best conditions to allow healing to take place. A knee strap will help ensure that the area is well protected against future knocks. This support of the joint further helps to boost recovery. By isolating certain areas of the joint and in some cases immobilizing movements completely, a knee strap can be an essential item when returning from a recent surgery. One of the biggest issues when returning from injury and the reason why many who suffer serious injury can never return to the same level of performance is confidence, or lack thereof. The often subconscious fear of re-injury inhibits athletes in any sport from taking the same risks and pushing their bodies to the same limitations they were previously capable of reaching. In this situation, the real protection afforded by a quality knee strap should not be underestimated. It can help to provide the mental boost which sees an athlete or recreational sportsperson, in this case runners return to peak levels of performance and enjoyment post-injury. There are several options available if you are searching for a knee strap. These will vary depending on the nature of your injury and what you want from a knee strap, however the knee strap in the most basic form is a very simple design which does its job effectively both in terms of cost and result. At this end of the spectrum, the Mueller Jumpers Knee Strap is an excellent example, with its minimal design, Velcro connection and polyester fabric, this no-frills band does an excellent job at providing the additional knee support in an efficient and value for money fashion. The Abco Sports Patella Knee Band represents one of the most popular choices on the market. Its nylon and neoprene combination make it both lightweight and highly flexible. It has dual adjustability, allowing the wearer to place it precisely for maximum comfort and effectiveness. Another cost effective and high-performing option for those requiring additional support. These are just two of the many options available in terms of knee bands. You can find more in-depth reviews on these products plus several other knee straps suitable to protecting and assisting with your knee injury here. It is unquestionable that running is an activity which bears a toll on our bodies after some years. The attritional nature of the sport is replicated within the gradual wear and tear nature of the knee injuries sustained. While noting the excellent number of straps and other equipment available to help protect us from injury, we should also note the importance of foresight when it comes to running. Preserving our bodies now by ensuring the best conditions and use of the best accessories will undoubtedly reap dividends in the future. Be sure to check out the other areas of our site for more information on straps, sleeves and braces for that added layer of protection as well as a host of other educational information to ensure you are armed with the best possible knowledge regardless of your chosen activity.